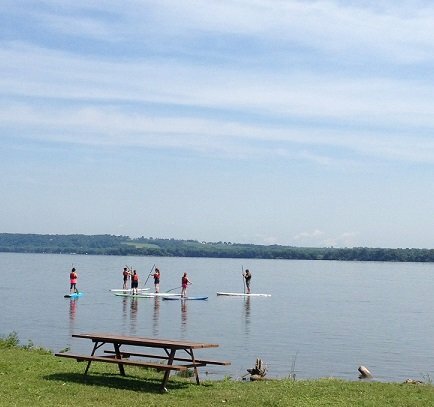 This two hour class offers an introduction to the sport of stand-up paddleboarding (SUP). On-land learn handling your paddle, mounting the paddleboard, and proper body position for balance. On-water instruction includes launching, various stroke techniques, maneuvering the board, and safety and rescue techniques. This instruction period will be followed by a short SUP paddle tour. SUP board, paddle and pfd are provided. Students should wear clothing that will get wet as well as water footwear. Flip flops are not recommended. We also suggest a hat with a brim, sunscreen and a water bottle. Shank's Mare instructors have years of experience introducing and teaching participants stand-up paddleboarding. Includes board, paddle, pfd and instruction.